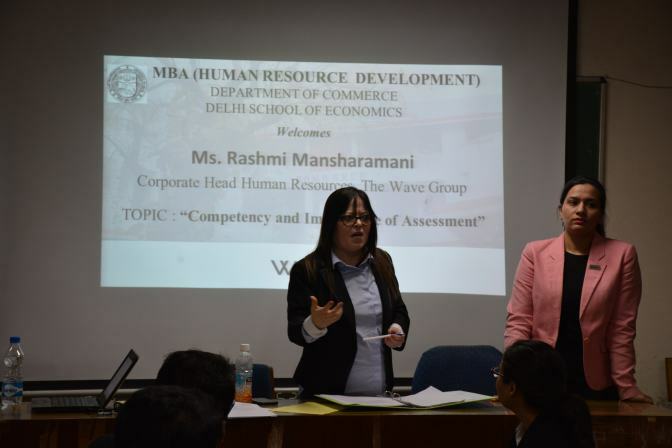 On the 9th of February, 2018, MBA (HRD), Department of Commerce, Delhi School of Economics organized a workshop by Ms Rashmi Mansharmani and her team. Ms Mansharmani is the Corporate Head, Human Resources for The Wave Group. The topic of the workshop was ‘Competency and Importance of Assessment’. The students were divided into five groups of six members each. There was a discussion on the meaning of competencies and how psychometric tests help bring out hidden variables not visible in face-to-face interviews. Ms Mansharmani explained the importance of using the right Talent Acquisition tools with the advent of artificial intelligence. Thereafter, six activities were conducted to help students get an idea of the practical application of talent acquisition methods. Students were given a list of competencies and the activities involved identifying the right set of competencies for a given job description. A role play also conducted to help students understand the actual challenges faced by HRs. Students were also asked to frame interview questions for assessing certain competencies in a candidate. The workshop was a great experience for the students and it helped them understand the skills required and challenges faced while working as HRs. It also helped them get an idea of the practical aspects of competencies and the way assessments are carried out. We are very thankful to Ms Rashmi Mansharmani and her team for conducting the workshop. We look forward to having her and her team on campus again for more such interesting sessions.